We’ve been exploring and playing more with our fun washi tape—decorating Easter eggs (shown here) and making suncatchers. The washi tape is so thin and somewhat transparent, that it lends itself well to decorating small, odd-shaped items such as eggs. Maia used it to create her large Eggbert family and I used it to fancify a few humble Easter eggs. Maia and I both mostly just wrapped the washi tape around our Easter eggs as the base for our decorating efforts. We used scissors to cut the tape, but have since learned that you can just tear it! And it works! Maia was in a playful mood when we decorated these eggs and started calling her creations “Uncle Eggbert,” “Baby Eggbert,” “Cousin Eggbert,” and so on. There were lots of giggles that accompanied each new Eggbert addition. Once she had all her Eggberts, she decided they needed to be numbered, and so grabbed the sharpies. Once they were properly decorated and numbered, she lined them all up on the windowsill. Note :: The washi tape rolls acting as perfect little egg stands. Here is how I decorated my eggs. I found triangles super easy to cut from the tape, so mostly just used lots of them. Plus stripes of the washi tape. We tried some white eggs and some dyed eggs as I wanted to see how the washi tape would look on both. Parts of the tape are pretty transparent and allow the color underneath to show through a bit. I like them both ways, but think the white ones set off the washi tape a tad better. Bristol Parenting Cafe cut her washi tape in half lengthwise, then wrapped it around her eggs. Simple and pretty! Wee Birdy wraps the entire egg with pieces of washi tape for an overall look. Lovely Indeed shares a mix of elegant and modern designs and ideas. 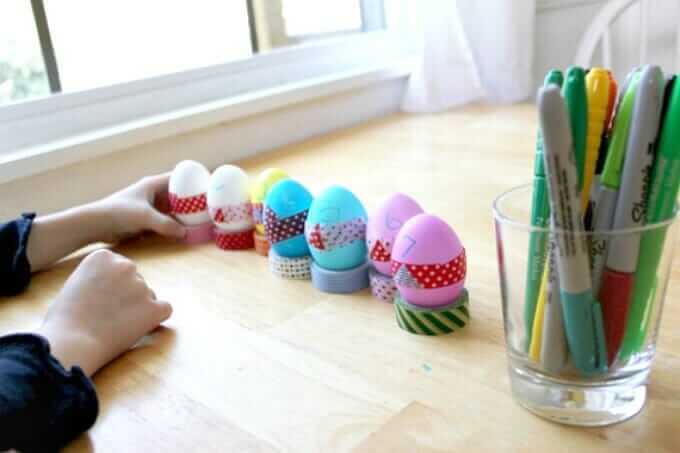 And Craftaholics Anonymous shows how to use washi tape to decoratively seal the two ends of plastic eggs that have been filled with candies. If you have any other ideas for washi tape Easter eggs or know of another good blog post showing them (your own or someone elses), please feel free to share in the comments! Does washi tape stick on its own like masking tape, or do you need to moisten it? It sticks on it’s own. You should try it! I think you would like it, MaryAnn. I just ordered some. Can’t wait to try it!! I’m having it shipped to a conference in Iowa and will be experimenting with it for the first time along with the 200 people my art room. FUN!! What an egg-cellent family! I especially love that she numbered each one, so sweet. Hello! Looks like you had lots of fun egg-making,and I loved the dyed ones. Thank you so much for mentioning me too – Happy Easter!